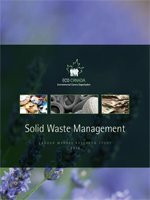 With more than 70,000 Solid Waste Management (SWM) professionals working in Canada, training and succession planning will be critical for the successful management of the solid waste industry. Solid waste mismanagement can result in pollution of the atmosphere, soil, water, and the environment in general. This study looks at the evolution of SWM, focusing on environmental jobs within the industry and offering perspectives from SWM employers and employees.